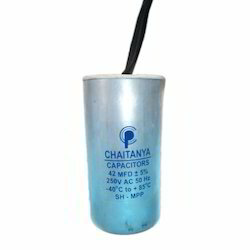 Chaitanya Capacitors Private Limited is the preferred name in the industry that manufactures, exports and supplies precisely designed Cylindrical Type Capacitors. Durable, lightweight and efficient, these high functionality capacitors are provided in multiple specifications to fulfill the varied client requirements. Cylindrical type capacitors are tested before the final dispatch. 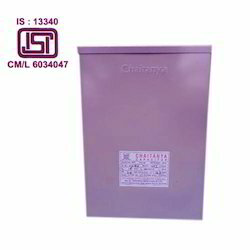 Manufactured as per the predefined industry guidelines, these Box Type Capacitors are provided in different ranges to meet the varied client needs. Lightweight and compact sized, the offered series of capacitors is massively acknowledged for its high durability, weather proof coating and excellent frequency. Box type capacitors are provided in standardized packaging. 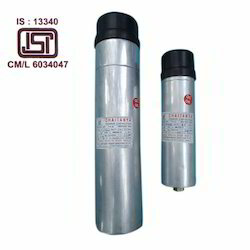 Our company is concerned with the manufacture, supply and export of an ample selection of Discharge Lamp Capacitors. Highly admired for its ability to improve the power factor and high insulation resistance, the provided assortment is extremely famous in the market. These capacitors are available in different specifications to meet diverse client demands. Looking for Discharge Lamp Capacitors ?